Usually, I’d wait until Friday for your procrastinatory reading of the week. But seeing as how many of you will be calling in sick tomorrow (coughcough! hackwheeze! sniffle! ), let’s get to those links today. Babes Love Baseball has the new SI cover and it’s….bizarro! Walkoff Walk has an amazingly destructive Albert Pujols leaving nothing but carnage in his wake. Gaslamp Ball has the pictures. Home Run Derby has video of CC Sabathia farting. Hey, we try to put in a little something for everyone in these posts. Bus Leagues Baseball wants you to help come up with a nickname for Jay Bruce. “The Bruise,” anyone? 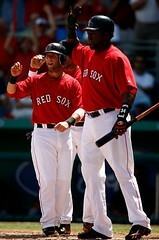 Call of the Green Monster has breaking news: already-diminutive Sox infielder Dustin Pedroia seems to be shrinking. River Ave Blues makes a strong case for using instant replay to get home run calls right, on the heels of yet another blown call. Earlier this week it was Delgado. During the 2007 ALCS, it was Manny, with the 390 foot “single.” Who else has to get robbed just so we can preserve the “human element”? The Hardball Times takes the media to task for dismissing the Bonds/collusion whispers as conspiracy theories. For the record, I’ve also dismissed those whispers. But this post is the first thing I’ve read that has made me think again. DRaysBay makes the case that Tampa Bay has the best 1-2 punch in the AL East. In case you’re keeping score at home, there’s only a week left of May and the Rays are just two games out of first place. Joe Posnanski has another curiously long post touching on, in no particular order, Mike Piazza, Yaz, and whether Pedro Martinez’s 9 perfect innings should count as a perfect game. He notes that after he wrote this column, in which he included Pedro on a list of great no-hitter hurlers, he received a number of emails from people (including yours truly) saying, “Hey, wait a minute! that’s not technically a perfect game!” Joe posits that while that is technically true, he considers it a no-hitter, “record books be damned,” since Pedro pitched 9 perfect innings (he gave up a double in the 10th). I kind of like the idea that we can damn the record books and restore a perfect game to Pedro, a great pitcher who never seems to get any real run support. However, I think this is dangerous—for instance, can we say that Varitek has called five no-nos because he actually called for the right pitch in Curt Schilling’s eight-and-two-thirds bid last year? I mean, Tek was sure Shannon Stewart was swinging. He called for the slider. Schilling was equally sure Stewart was taking. He wanted to throw heat. Schilling threw a fastball, Stewart swung, and there went history. (Incidentally, Pedro also shook off Tek in the 9th inning of his no-hit bid in 2000. Tek called for a curveball. Pedro, like Schilling, insisted on throwing the fastball. He gave up a single.) To me, that game in 2007 and Pedro’s games in 1995 and 2000 are just examples of those bittersweet moments in sports where greatness just slips away. As Schilling put it last year, “I get a big ‘what if’ for the rest of my life.” And so does Pedro. But maybe I’m full of crap. What do you guys think? And finally, if you’ve got the extra coin, you can get a Marlins World Series ring on ebay for the buy-it-now price of $6,250.00. Oh, and I’m going to shamelessly plug my own Boston Metro column too. It’s weird, I wrote this post on Lester’s no-hitter first, and then decided I wanted to write a Metro column on it too. It’s damn hard to write about the same thing twice and find something new to say! What else should I be reading? Email me! I am telling you, Footsteps in the Sand was written for him too. his next haiku is going to be about daily hug therapy with Dustin Pedroia. Sarah, I don’t think you can assume Pedro and Schilling would have thrown no hitters if they had just thrown the pitch Varitek called. What if they had thrown the curve that had been called and hung it? If a pitcher is not confident in his ability to throw the pitch called he doesn’t have the best chance to succeed. I would imagine later in a game a pitcher may feel they have better control of their fastball. The other thing no one mentions is that there were probably signs given earlier in the game the pitcher shook off and the pitch was successful. It’s always easy in hindsight to say what if and that’s why it’s so special when a guy actually does get the no hitter. Yes, Melissa, I agree. There were cases, for instance, in the Schilling game where he did shake of Varitek—i think they said maybe five or six pitches Schilling had already shaken off. The Pedro game, I don’t remember. I wasn’t trying to make the case that those near-no-nos should count for Tek, just that when you start fudging, it’s hard to stop. The ol’ slippery slope, in other words. Like, just as Posnanski would like to say, damn the record books and give Pedro his perfect game, I would be tempted to say, damn the record books and give Varitek at least one more no-hitter. I admit these are not quite the same, but I think they are pretty close. After all, if Curt Schilling had thrown the pitch that Tek had called for, Tek would have five no-nos. And if Pedro’s teammates had scored even ONE RUN, he would have his perfect game. I think a perfect nine innings is not a perfect game, if the game is not over after nine innings. It’s a team game, and it’s a game that’s designed to break your heart. Its the whole coulda shoulda woulda theory. If I remember correctly, Schilling had Stewart at an 0-2 count, so most likely stewart was thinking he would waste a pitch. So why not try to fool him with a fastball over the plate? Pedro, in my mind, from 99-00, was the greatest pitcher in baseball history. Its a shame that Greg Vaughn and John Flaherty (it was flaherty that broke up the no no, right? And Vaughn, for some odd reason, always seemed to hit him hard) had his number, otherwise he would have had that no hitter. Although, I agree with joe. 27 outs is 27 outs. Sarah, I’m with you except for the part about Tek having five no-nos if Schilling had thrown the pitch he called. There is no way of knowing what the outcome of that pitch would have been. How can you assume that there would have been a different outcome if a curve ball was thrown? It’s possible it could have worked, then again it may not have, we’ll never know.